As promised, I’m showing here the two watercolor paintings of my almost-five-year-old son. These are my favorites of all that he’s done in his painting class at Whiz Minds CAMP. He’s the youngest student in class; he’s turning five this July. 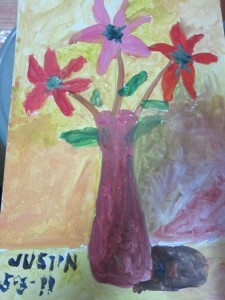 At first, the center wasn’t too keen on accepting my son for painting class because the minimum age they require is five. Younger kids have short attention span, and that might pose a problem. I assured them, however, that my son listens attentively to teachers while inside the classroom, but not to Mommy! LOL! Last Thursday was his last day of painting class. The summer students of WHIZ Minds CAMP will meet again on May 31 at Robinsons Galleria Activity Center for their recital (for those who took dance classes) and exhibit (for those who took sketching/caricature and painting classes). There will also be fun activities for kids on this day, such as face-painting and games, so the little boy and this mommy are excited much! Because of too much anticipation of this event, I totally forgot to do my online task on adipozin reviews. Oh well, that can wait! 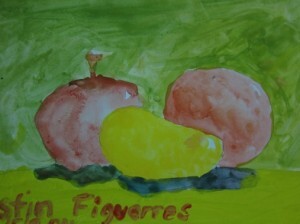 This entry was posted in Painting Class, Robinsons Galleria, Summer Class, Watercolor Painting, Whiz Minds CAMP. Bookmark the permalink. I like it! He sure shows promise. Kudos to your kid!At ang galing nyang mag painting ha^_^He’s got potential to make it big in the future,good luck to him! Justin has great painting skills. Will surely enroll Peaches when she’s of age na. This is so timely because I am recently engrossed in looking at the love and happiness artworks here!